Stephen Henry failed to return to Magilligan Prison in Northern Ireland earlier this week. FUGITIVE MURDERER STEPHEN Henry appeared in court in Dublin tonight, where he was released with a fine following a drunk and disorderly arrest. 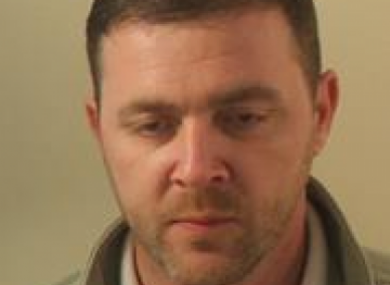 Stephen Henry, 41, from Belfast, who went on the run after failing to return to Magilligan Prison in Northern Ireland earlier this week, was arrested drunk in Dublin this morning after being thrown out of a city-centre hostel and getting mugged. He was brought before Dublin District Court this evening and let go after being fined €75 for a public order offence that does not carry a jail sentence. A European Arrest Warrant had not been issued yet and could take a week, the court was told. Henry did not return to prison on Monday after he was granted a day-release pass to visit his family. The PSNI launched a manhunt and appealed for information into his whereabouts. Henry was jailed for murdering father-of-two John Cooke in Lisburn. After failing to return to prison on Monday the PSNI issued a statement saying he may be in either the Craigavon or Belfast area. However, he crossed the border on Tuesday and was picked up by gardaí in Dublin today. He was arrested at Merrion Road, Dublin 4 at 8.50am on a charge under the Public Order Act for being intoxicated to an extent he might endanger himself or any other person in his vicinity. The offence can result in a fine of about €130 but no jail sentence. Henry, who has tattoos on both upper arms and scars on his forehead and left ear, was brought before Judge Conal Gibbons at a late sitting of Dublin District Court. Dressed in a black tracksuit, green and white shirt, and brown shoes, Henry, with two cuts on his forehead, remained silent during his hearing. Garda David Carty told the court that Henry, who is currently of no fixed abode, had been brought to Irishtown Garda Station and made “no reply when charged”. He objected to bail, however the judge pointed out that the charge did not carry a penal sanction, just a fine, and the High Court would not be pleased if he refused. There was no charge before the court for being unlawfully at large and he also said that being homeless was not a reason for refusal of bail. Defence solicitor Tracy Horan said she had voiced the same concerns and she agreed with the judge. She also said she thought it would be at least a week for a European Arrest Warrant to be issued. Garda Carty said contact would be made with Interpol. Judge Gibbons held that he had to grant bail but because Henry had no ties to the jurisdiction he was going to require him to lodge €50 cash. However, Horan said that her client had been robbed overnight; his bag and phone were taken. He had a brother in Dublin but did not have his number. She argued that asking for a cash lodgement was tantamount to refusing bail. Judge Gibbons said the lodgement would be required because Henry had no ties to the State. This would have resulted in him being remanded in custody until the bail money was lodged. The defence solicitor took instructions from Henry at the side of the court and then told the judge her client was pleading guilty. Garda Carty said when he observed Henry walking on Merrion Road, he had no shoes on and was “completely unaware where he was”. He was arrested for his own safety. The court was told he was serving a sentence for murder in the North but did not return after being given day-release. He has no previous convictions in the Republic. Pleading for leniency, Horan said Henry had been robbed and his phone was taken on Thursday night. He was intoxicated at the time and it was “a little bit a blur”, she said. Judge Gibbons gave him a €75 fine which must be paid within one month. Henry, from Mountpottinger Road, Belfast, was jailed for life at Craigavon Crown Court in 2006 after pleading guilty to murdering an acquaintance with a Samurai-style sword. When contacted by TheJournal.ie for comment, the gardaí said they do not comment on named individuals. Stephen Henry remains unlawfully at large from HMP Magilligan. PSNI is aware he is now outside of our jurisdiction and officers are actively working to have him returned. Email “Fugitive murderer who escaped from Derry prison is arrested in Dublin, then released”. Feedback on “Fugitive murderer who escaped from Derry prison is arrested in Dublin, then released”.